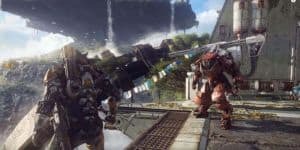 Anthem: Hints and Story Details | Nerd Much? In an interview with CBC Radio, general manager of BioWare Aaryn Flynn dropped a few hints and story details about BioWare’s new game, Anthem. Though we still know very little, Flynn shared some of the ideas that inspired the structure and narrative of the game. Flynn states that in Anthem, you play the part of the Freelancers, a group that goes out and protects humanity from a variety of enemies, including aliens on a far off planet. Beyond this, Flynn states that Anthem is like Star Wars or the Marvel universe, in which you are not too concerned with the science of things happening around the main character, but are no less amazed by them. I think a good example of this is in the Star Wars prequels, in which Liam Neeson’s character says “there’s always a bigger one” after being chased by a large dinosaur-like fish, which is promptly eaten by a much larger dinosaur-like fish. Whether this is a good thing is up to the writing, if it is done well, then there will be no questions that happy fanfiction writers won’t answer. If it not done well, hopefully, the gameplay can make up for it. Anthem is expected to release by the end of 2018 on PS4, Xbox One, and PC.